Marketing is one of the issues within the company that deserves attention. But marketing is not alone. Because marketing decisions have an impact on investment, perhaps the strategy of the company, on money and investments, the type of colleagues and on the operational capabilities that you need as a company. Conversely, all these things also affect marketing. In this article, thanks to Peter van den Heuvel for his contributions to this, I present a way how business alignment systematic cab form within the company through the so-called Company Reference Grid. The Company reference Grid was early introduces into the literature by Peter van den Heuvel in his article Unified Organizations. Do you fit in? Marketing can not only use this approach to make the own position within the company clear in the vision, entrepreneurship and executive ability. The Company Reference Grid is an elegant format to capture the vision of customers and markets and implement them in all aspects of the business. Do you test your account plans of marketing & sales on completeness and consistency? In other words, do we know enough about the customer? Do we as a company have a clear vision of the client? Does the customer experience exactly what we meant? We need references to identify the relationship between businesses and see the consistency or the lack of it. The Company Reference Grid brings, in a systematic way, business vision, resources and people together and gives a quick visual overview of the status and the possible steps to take. Important in these times, because one moment you are in and another you’re out. It gives direct insight into who you have to work with and what you need to tune. This also applies to the marketing department. With the Reference Grid Company a way of working is developed, where simplicity and commitment will come to best advantage. Internet is forcing you to create new choices that will change the social cohesion in the organization. Control on pluralism and the establishment of a single flexible structure is thereby preferred. How does one organize this with a view on synergy, transparency and cost? And how do we embed what is good and let go of what we no longer need? The Company Reference Grid provides guidance in a short time. Upon deployment of the marketing plans this can be used in practice. Every great change begins with the first step, but we often linger because we do not know where to start. The Company Reference Grid makes it possible to start at an arbitrary point. Whether it is your customer data, which you want to do something with, a new app which you want to introduce, or look into your employees regarding their internet marketing skills, it soon becomes clear where you then have to deal with. For those who are using this for the first time, here is a roadmap. You can then create an integrated new business plan in a few hours. 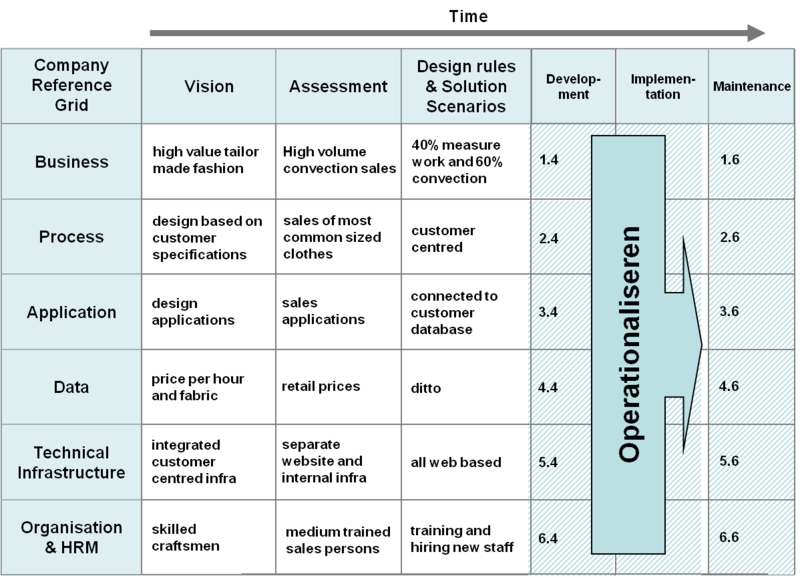 In Figure 1, the x-axis shows the different phases in which vision is developed and integrated into the business. Here, the ‘what, how and do questions ‘are answered. You have probably already answered the ’why question’ for your company. This is in fact the starting point of the new plan that you are going to make. The y-axis shows the key aspects of the business. These are also placed in a ‘what, how and do’- perspective. As you can see, everything is directed on ‘do’, because there is often no time for long processes. With the combination of the x-and y-axis, the processes can be set up based on a vision, in balance with the practical situation. This creates an optimal alignment and optimizes the operational strength. In terms of sales: ‘We’re in business’. Both the x-and y-axis form a ‘what-how’ hierarchy. This means, from each cell in the matrix, that you have to take the next step either to the right or down. The vision on business (cell 1.1) is both the framework for assessment (1.2) as the vision of the processes (2.1). On first use, the start of the model is at 1.1. (business-view) and can be worked out first both vertically and horizontally to 6.6 (operational HR management). In practice, there is not a linear effect but an organic process, in which the choices can be bought together in different compartments, and brought into balance iteratively together. In that respect it resembles a creative marketing process. You start with an idea and work out all the pieces into a creative and appealing concept. In this case it is marketing + +. You don’t do this alone but in cooperation with your colleagues from IT, operations, management, etc. How do you get coordination and cooperation with changes that affect people? After all, people want to change, but do not want to be changed. A lot of the inefficiency in change is caused by miscommunication, unnecessary complexity, ignorance and lack of clear choices or even contradictory choices. Bundling of both the individual as the total perspective, should give direct insight into the situation and incite action. The following is the recipe for those who will chart the organization for the first time. 1. Map all stakeholders for each box of the CRG. Each box has at least one name, at the same time responsible for that component, with associated personal- and access information. Question 1.1: What do you want to earn money with and how? Question 1.2: In what business are we and what do we stand for? Question 1.3: Do we send on customer margin or product margin? But above all remember the own relevant questions. A joint session, on the condition that there are not too many stakeholders, may also contribute to joint and mutual understanding. 3. Map the situation in each row map with respect to the vision, assessment, design rules, solution scenarios, development, implementation and management. Express these in simple and short terms. For example: total provider XYZ, XY provider, innovation, partnership, product Z, control per month, or based on crowd sourcing. 4. Highlight white spots, overlap, inconsistencies or contradictions. If Marketing calls something, can the operation deliver? The CRG may then be applied in various ways. Inter alia, to analyze the impact of various marketing plans, for example in relation to the business vision, the executive power of the company or in terms of the inner consistency. The first customer comments can immediately be placed next to the CRG and you should check whether it was intended in that way. Do you already have such a checklist, which immediately gives insight into the action to take? (question 2.1): What should the process be able to do, to make this possible? (question 3.1): What applications are needed to run processes efficiently? (question 4.1): How do you store customer data? (question 5.1): Do you want an integrated system of one supplier or multiple systems from multiple suppliers? And finally (question 6.1): Do you want a hierarchical- or network structure? With the completed CRG in the first phase, it immediately becomes clear what steps should or could be taken (solution scenarios). – Manage the whole picture and parts (combination of CRG parts from the rows and columns). This is further illustrated with a practical example. Internet and the new possibilities it offers, compels many companies to look at their business, the structure of the organization, its staff and the way it is controlled. Just look at the impact of communities, crowd sourcing and marketplaces. The new business vision is bought into balanced with the appropriate organizational structure and staffing. This can be performed in different phases, where, after each phase, the process can be repeated again. A practical example is a Dutch organization with multiple locations and over 1000 employees. The name, for strategic reasons, is feigned to ‘Example’. 2. Developing and implementing a good e-business strategy for the entire organization. Picture 2 – translation vision to solution: which errors can be prevented by using the CRG? From the CRG-thoughts, the first vision of Example is mapped. In Figure 2, the core concepts of this vision are displayed. The results of the question- and answer game were a reason for management and policy makers to make e-business leading in the business strategy. This strategy stands for Example with a proper design of a digital connection: example.nl. The main questions, in the first line (1.1 to 1.6) of the CRG, are answered. Moreover, there are more and more companies shifting to a digital business, or a combination of bricks & clicks. Key concepts in this example: visibility for the customer, respond flexible to market, structurally internal working on correct information transfers and information flow. Subsequently, example.nl is appointed as a trigger of all ICT-related business innovations. The new vision of Example has enormous consequences for the activities of the staff and management. The CRG is used as a social security card, in which existing and desired competencies are aligned with the new business strategy. The results are included in the bottom line of the CRG, question 6.1 to 6.6. Many resistances can be prevented by adjusting the competencies of staff to the new vision. Also, for each of the different boxes of the CRG, HR-competency questions can be asked. Questions here are: what does the staff know from top to bottom about ICT; what computer skills do they have; what knowledge do we need; what would someone like to learn; who we can ask to organize the training; how can we provide this tailored to employees; not just thinking of the functional contribution of the employees, but who are the employees? Organizing, with respect to the internal determination of everyone on the work floor.. Besides competencies, attention should be paid to leadership, especially because of the lack of leadership and excess management. Management is to ensure that place is run and is running well. Leadership, however, is bringing people into new relationships and different ways of working and to lead and give them direction on this. We must get rid of pyramid structures and look for networks. In a network, people listen to the leader due to his intrinsic competence, not because of the position he holds. One of the questions that can be asked in the context of the CRG is: in what way does the management of Example motivate the local branches, which differ widely in structure and process, adapt to the new business- and communication model example of example.nl? Once the vision is established, it is assessed on terms and feasibility. In the Assessment column, one looks at the current situation in which the organization is located and bottlenecks that occur there. Then any conditions and scenarios are outlined (Column Design rules/Solution scenarios), in which carried out projects must comply. These are itemized characterized. Note, the CRG method should result in a quick result; no extensive analyzes and determine things point wise by, for example, interviews with the concerned management. Experience shows that such a ‘business scan’ can be done in three hours! In addition, it is important to create an image of the projects which should be carried out, in order to realize the vision. One needs to estimate the profitability of the projects and in what order the projects should be realized. The implementation strategy is key here. Within the approach of the CRG, this is obviously done in outline. The whole process of vision, assessment, design rules and scenarios often proceeds iteratively. For example, when the vision turns out to be too ambitious, it will be revised downwards, while it is also possible, after the development of the scenarios, new opportunities arise and the ambition can be adjusted positively. A pitfall is that the current situation constitutes a major impediment to the solution scenarios of an ambitious vision. Nowadays, this can be solved by completing the columns in the correct order first and after that tune the content. Back to the example of Example. For years, internet initiatives were addressed at local and regional levels. Often with limited resources and a limited vision. But the consumer is not waiting for fragmented information which, additionally, keeps on showing a functional and graphical structure. The sector, in which Example operates, is one of the parts of our society where consumers use the internet in a high tempo to orientate and buy. Combined with rapidly emerging online competition, Example loses its position even more. Eventually they decided to change their strategy drastically and to place the internet centrally in their business strategy. It was decided on to place example.nl, which they had left unused for years, centrally in the communication strategy to customers and suppliers. This strategic repositioning had and has an enormous influence on the business model, the internal processes and management control. In the past, the communication mainly came from the local branches. As consumers no longer accepted that companies present themselves the way they are organized internally, “from the inside out”, it requires a different setup. Internet makes the company more and more transparent. With ranking, rating and reviewing, a potential customer quickly knows how your company is doing. A consistent organization prevents you from not keeping your promises. Client-centered development from demand is key for businesses that primarily communicate through new media. This requires a total different management of the internal organization of Example. Here they have chosen for a franchise formula. It should be mentioned that this organizational change was already employed at the time that the new e business-strategy was adopted. Information flows should be brought together to a certain point, and then the consumer can search for the information, relevant to him, on his own way. An analogy which is used here, although frequent and often bandied about is the exchange of information between consumers and brokers. In that world, in a similar way for consumers relevant information is very distributed. This is now centrally brought together through a daily exchange and made ​​available by the well-known portal Funda.nl. Demand and supply of houses is now easily visible and available. The position of the branches play an important role in the realization of the formulated vision of Example; how do you deal with the position of bricks & clicks. But also the position of entrepreneurs, partners and competitors was central, as well as the collection of various types of information. The content and sequence of the various projects has asked for adjustments several times. But the big picture has been detained, and despite the fact that there is still a lot of work on the realization of the strategy, Example is firmly convinced that they will come back stronger. After completion, the CRG can serve as an example so more ‘if-the’ situations can be evaluated. The CRG works imaging and simplifies complexity. A radical vision-and strategy change requires careful project planning. Consistency must therefore be created from another perspective, other than the column- and rows approach described above. Associated pars of the CRG can be defined in projects. Every project has its own project manager and an own project name, which indicates a goal and/or focus. Think of e-business strategy, HT-change plan, information- and management planning, communication plan, application and IT-architecture. Possibly with the additions development, implementation or management in case the project is clearly defined. When a project is defined over multiple columns, one should take into account the different responsibilities for, for example, vision development and implementation. In the project the columns can be defined with different people responsible. By placing the project steps in the time, dependencies and coordination issues become clear. The CRG serves as a calendar, checklist, project plan, information archive, telephone directory and management tool for projects and business. With regard to the control of the business card, it can serve as a business balanced score card (BBSC). The terms in picture 2 are bundled in projects and appointed as shown in picture 3. Projects A to M are placed in a logical sequence, but run parallel to each other for a large part. The CRG can also be used as a reporting tool. Per box one or two critical performance indicators (KPI’s) or results can be described with, for example, a traffic light that directly indicates the status. Red for a critical line or downward trend, orange for extra attention and green for o.k. In this way, the status, possible connections and dependencies are shown in a glance and it shows where action is required. Keep reminding the user to the original purpose by using the terms which are used in the original CRG. Managing the KPI’s is not a goal on itself. Terms such as demand-driven, client oriented and one point of information represent as core values the way in which the objective has to be achieved. The encounter with the employee and the customer plays an important role in achieving the KPI’s. The purpose of the CRG is connection after all. The projects D, E, I, J, K and L can cascade under one person responsible and can be pointed in one integral ICT architecture- and infrastructure plan. 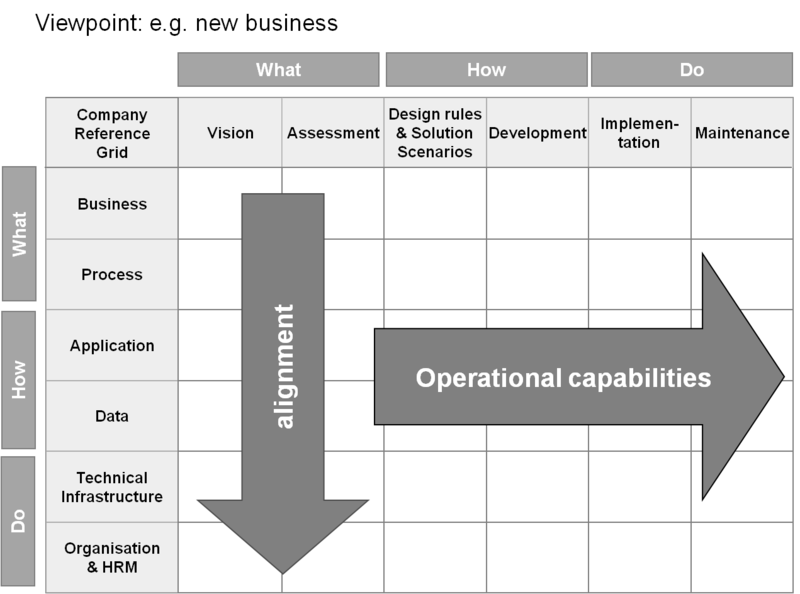 This must, off course, connect with the other components like the HRM change plan and the business strategy. The KPI’s can be translated in a combination of ICT and business elements like the amount of different applications and releases and the associated costs. Also, the KPI’s can be defined on the search behavior of the customer of example.nl: the amount of unique visitors per period, how often is a product ordered directly, the score per location, etc. KPI’s can also be formulated on the ICT skills of the employees. After the CRG is used as a design tool, it can, off course, be used for management and as a knowledge management tool, which connects essential knowledge and people. Do not be deterred by the multitude of possibilities. By filling in the CRG together for the first time, gives you insight into new opportunities or into solving problems. The CRG has more than ones proved to be a very practical and useful tool to engage companies into change. In addition, the simplicity ensures that one is finished sooner, something which is sometimes essential today. Especially visualizing coherence and corporation gives people support. Despite that everything in this grid is divided into squares, it permeates the ‘box-thinking’ and causes one to look over their own borders. It forces the user to describe concise. These expletives can be communicated easily and are fast recognizable for everyone. The CRG is very versatile and can therefore not be fully described. The applications like HR-competency overview, project plan, information- and documentation overview and Business Balance Score Card, are just some examples. When using the CRG, one probably will find new applications and the whole gives insight in new business. The main result is perhaps the realization that you are not alone and together you are capable of more. This also applies to marketing! The marketing agenda in the Internet Age. part 1: ‘Why’ your Company? The marketing agenda in internet times. Part 3: The market has little time and does not wait. The marketing agenda in internet times. Part 5: marketing organization. Who’s at the wheel in your organization?